Home > Diet & Nutrition > Questionnaire: Are You Eating an Anti-ageing Diet? You may think you eat a pretty healthy diet but are you sure that what you eat contains the right things to help fight the process of ageing? Nutrition plays an important role in the fight against the ravages of time. Nourishing your body from within can be as effective in combating ageing as using the latest anti-ageing treatments on the outside. One of the biggest enemies which causes ageing is ‘free radicals’. These come from environmental pollution, smoking, UV radiation (sunlight) and other sources and they destroy a lot of cell structures, such as collagen in the skin which is responsible for giving your skin its elasticity and youthful appearance. 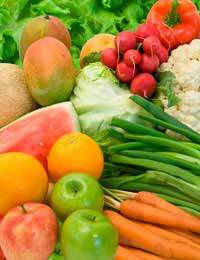 So it is important to eat a diet high in anti-oxidants, which will combat these free radicals. 3)	How do you choose your vegetables? b) I try to eat as many different colours as possible, especially dark, leafy greens such as spinach and broccoli, plus carrots, red peppers, squash and other brightly-coloured vegetables. c) I pretty much have the same vegetables all the time – green peas, carrots, sometimes a bit of salad. 4)	How often do you eat oily fish, like salmon, herring, mackerel and trout? 5)	Does your diet contain lots of Vitamin E? b) Don’t know – what things contain Vitamin E? 6)	Which of the vitamins are good antioxidants? 7)	How would you make sure that your diet is high in selenium? a) by eating lots of mixed raisins and nuts, tuna, sardines, scallops, squid and other fish like lemon sole and mullet. c) wholemeal grains, protein from lean meat or poultry, fish and eggs, diary and lots of fresh fruits and vegetables. A balanced, healthy diet can play a huge role in helping to combat the signs of ageing. This means a diet rich in fresh fruits and vegetables, together with carbohydrate from wholegrain sources and protein from lean poultry or meat and/or legumes, plus dairy, nuts, oily fish and eggs in sufficient quantities. Lastly, don’t forget to drink lots of fresh water daily, as hydration is important for maintaining a healthy internal system and for achieving that fresh, plumped out look of youthful skin!